It is possible to extend the default set of available columns in tabular reports of detailed time list with your custom choices. Calculated values can be obtained from numeric and text system custom fields and populated by Custom formula Metrics. These custom columns are helpful when fields and properties important for you are missing in list of options available on Columns tab and cannot be added within Summary Columns. Custom Fields are available for selection only when a tabular report is based on single process. In tabular reports based on All Processes Custom Fields cannot be shown. It is possible to add column with names of types of work items. Calculated names are obtained from a text custom field added to the Time entity. 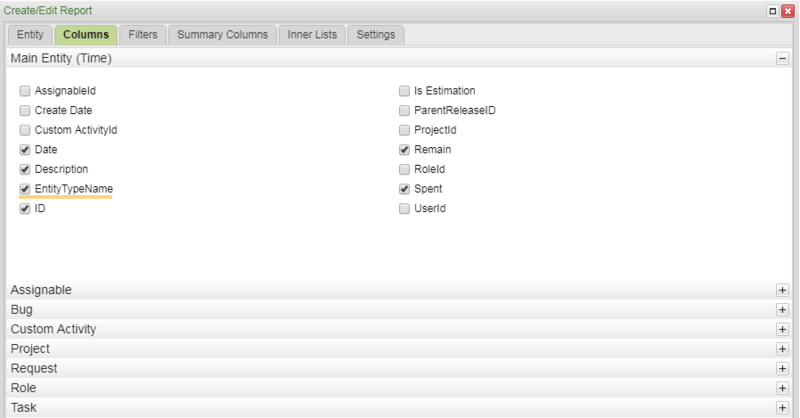 Create a new Tabular Report based on the Time entity. Select a single process with our recently added Custom Field. Select Columns for your report. EntityTypeName appears as column for selection. Numeric ID, Name, and other properties of any entity to which a Time record has been submitted can be displayed with checkboxes in the Assignable panel. All the types of entities to which Time records can be submitted - such as User Stories, Tasks, Bugs, Requests, Test Plan Runs - are Assignables. On the Settings tab, finalize creation of the report. Once done, it can be used anytime in future!